When was the last time you just got lost in a synthesizer? Like, when you forgot everything else you were doing and just turned knobs and forgot what hour it was? Well, if it’s been a while, you might want to try Sloo. If you want, you don’t actually need to read any more. 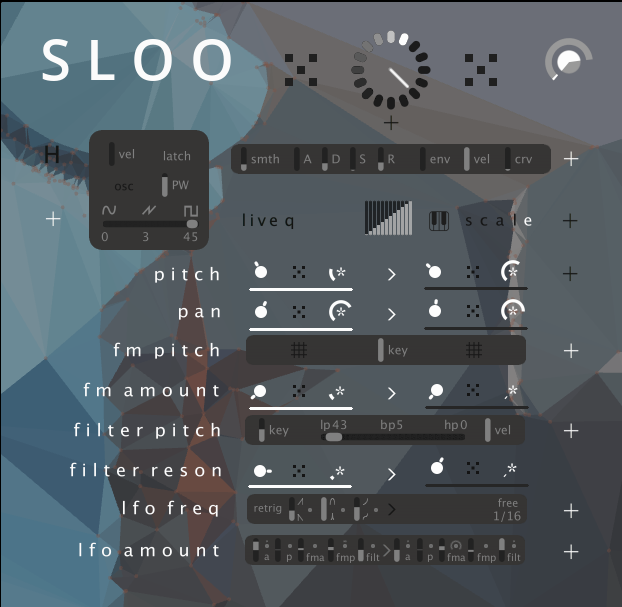 Just know that Sloo is a thing for Reaktor from Tim Exile, and it involves a gazillion oscillators, and it will make totally mental noises. It feels like someone has just heated up a giant, hot, steaming Jacuzzi of oscillators and you’ve jumped in and dunked your head. Here, this is literally the first sound I managed to make with it, plugging it into Bitwig Studio (just for kicks), and then … uh … let’s say I’m sure I did something highly technical and sophisticated. I definitely didn’t just turn up a bunch of knobs and move the morph fader around. That suggests I don’t really know what I’m doing, and just mess with stuff like a toddler. Ha! Okay, so what is this thing, anyway? Think of 48 independent voices – and imagine each voice has not just pitch as a parameter, but oscillator type, frequency modulation, and modulation via an LFO and mod matrix. And that’s it, really. Sloo isn’t complicated, but that’s a good thing – the results are insanely varied. You can make fairly slick, conventional lead synth sounds or wild EDM-ish rhythms or psychotic Xenakis-style sound assaults or any number of dozens of whole genres lying in between. And you can actually decide to do all of those things and morph between them. There are various other performances features: multiple scale settings (click on the different letters of the word “scale” – cute), pattern storage with live pattern switching, quantization, and an amplitude envelope (though that, too, is routed to the independent voices). If you want to delve in still deeper, start clicking the ‘+’ icons scattered through the interface, and you’ll find multiple filter types, LFO modulation and routing, scale editing, fine-tuned pitch spread options, and other more granular controls. The whole instrument is indeed a lot more sophisticated that it may look at first blush, by design. For getting hands-on, there’s Komplete Kontrol S-Series compatibility out of the box. I also found accessing parameters was really easy via Bitwig Studio, which mapped nicely to the parameters (and provided its own useful modulation and pattern control). But — I can’t emphasize this enough — you don’t need to know what you’re doing. The randomization settings here are always at hand in the clock-looking icon at the top, and you can always dial through previous random settings. At first, I thought that everyone would be all over a particular sound the synth makes – until I realized that was almost an utterly random occurrence, and it seems to make a bunch more, too. And Tim Exile, if you haven’t checked him out yet, is a rare bird himself, both a virtuoso electronic soloist who always gets everyone having a devilishly good time, and a master crafter of electronic inventions, largely by delving into the furthest depths of Reaktor. Also, Reaktor experts – this patch is unlocked, meaning you can get into its powerful inner workings if you’re ready. CDM is an online magazine for creative technology, from music and DJing to motion and more.